Update – 17 Feb – Samsung recently launched it’s new M-Series smartphones in India and Nepal and now the company is reportedly gearing up to launch the third smartphone of this series , the M30 in Indian market today. The M-Series are designed and manufactured in India at the company’s Noida factory. The Galaxy M30 is expected to be launched in early March at a starting price of INR 16,000 (NRs. 25,600) which will create major worry for Chinese smartphone makers like Huawei, Xiaomi, Oppo , Vivo , Realme and Redmi brands. Samsung is lately following the USP of chinese makers by providing better hardware specification and design at consideraly lower price point. It is getting into head on battle to regain its market share that it once lost to chinese smartphone makers. 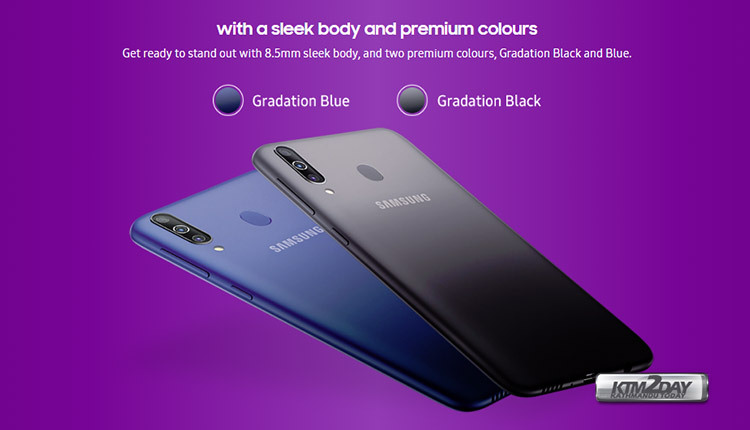 The South-Korean giant will be launching the Galaxy M30 today that would be directly competing with the Xiaomi Redmi Note 7 launching in the same price segment and hardware specs. 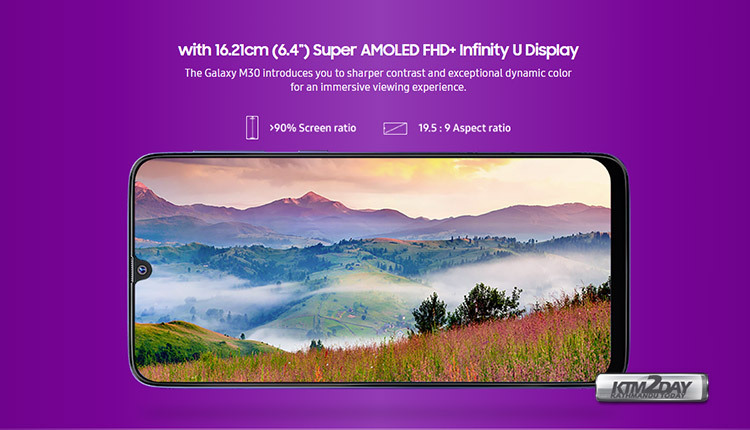 Samsung will be offering a better screen this time with 6.38 inch Super AMOLED Infinity V-Display design like in the recently released M20 and M10 series but those came with low quality TFT screens. 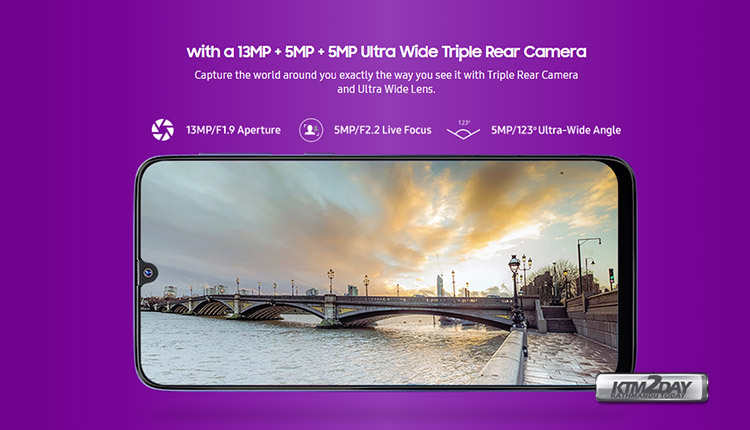 The Samsung M30 is expected to come with a full-HD + screen with a screen resolution of 1080 x 2280 pixels, 19:9 ratio (~395 ppi density).The 2.5D curved glass features an infinity-V notch for the 16 MP front-facing camera. The M30 will feature a water drop notch on the top of the display. A small bezel is visible at the bottom of the phone which could house navigation buttons. 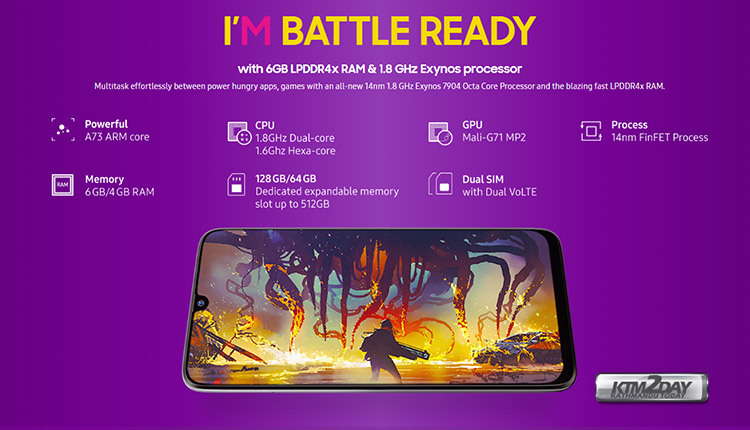 Under the hood, the Samsung Galaxy M30 is powered by the octa-core Exynos 7904 processor paired with up to 6GB of LPDDR4x RAM.The Galaxy M30 packs up to 128GB of inbuilt storage that can further be expanded via a microSD card (up to 512GB). In the imaging department, it packs a triple rear camera setup that comprises of a 13-megapixel primary RGB sensor with f/1.9 aperture, a 5-megapixel depth sensor with an f/2.2 aperture, and a 5-megapixel ultra wide angle lens with a 123-degree Field-of-View (FOV) and an f/2.2 aperture. On the front is a 16-megapixel sensor that has support for selfie focus. 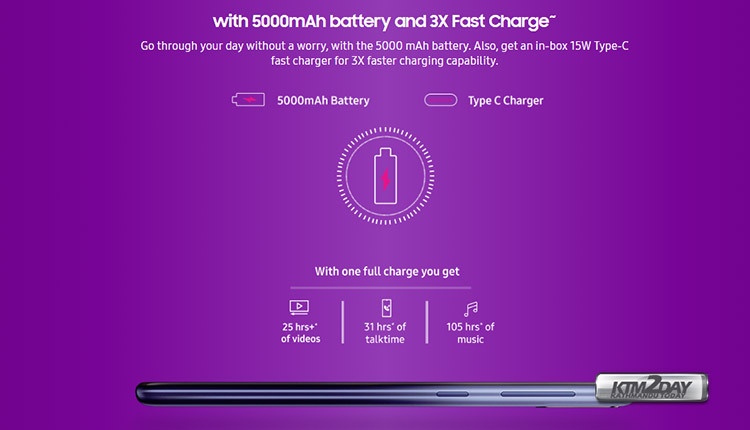 The latest Galaxy M30 smartphone comes equipped with a 5,000mAh battery and also has support for fast charging facilitated by the bundled 15W charger. 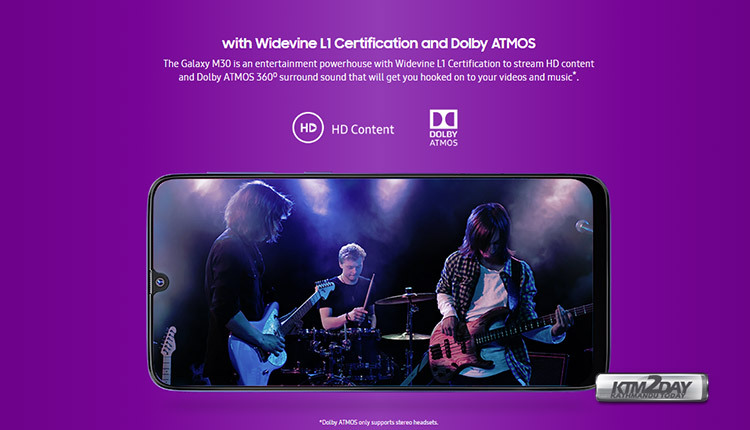 Samsung claims that the Galaxy M30 will easily last a full day and can be topped up at thrice the speed compared to a 5W charger via the USB Type-C port. It bears a rear fingerprint scanner, and a Face Unlock feature. The Samsung Galaxy M30 will run on Samsung Experience 9.5 UX on top of Android 8.1 Oreo operating system. Samsung has promised that it will soon announce the Android Pie rollout schedule for the Galaxy M30, alongside the Galaxy M10 and the Galaxy M20.As far as connectivity is concerned, the smartphone connectivity options include Bluetooth, dual 4G VoLTE, dual-SIM, GPS, GLONASS etc. Samsung is now all set to unveil the device on February 27 at 6 pm as hinted by a teaser on Twitter. The M30 launched today will be available for purchase from online stores like Amazon and Flipkart from 7th of march 12 noon. Samsung has launched the M30 at a price tag of INR 17,990(NRs.28,784) for 6GB+128GB variant and INR 14,990 for the 4GB+64GB lower variant. 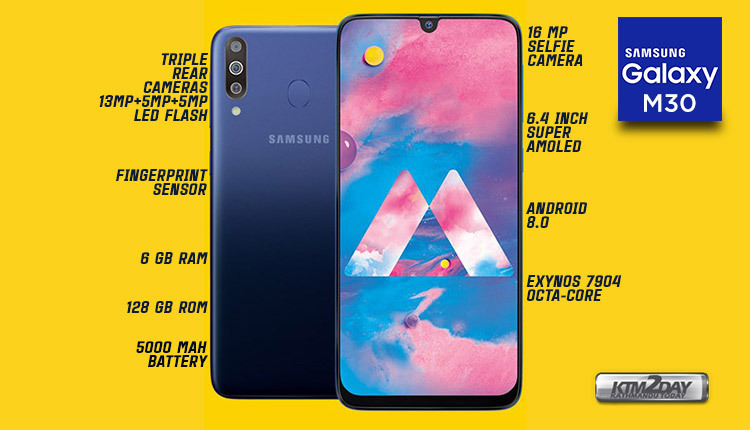 With the launch of new Galaxy A-Series devices at almost same price segment with comparable specifications and better build quality, the launch of Galaxy M30 is very unlikely to happen in the Nepali market anytime soon.